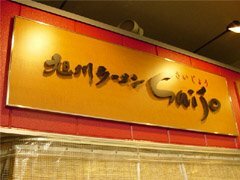 Saijo is another ramen shop among the collection of seven in Shinatasu, a small ramen theme park located right next to Shinagawa station. This is the fifth shop among the seven that I am reviewing and for the first time I am underwhelmed. Maybe I ordered the wrong ramen here? Saijo is famous for winning the the contest for best shio (salt) Asahikawa ramen, I didn't do all the research before visiting this place and on this day I ordered the 味噌ラーメン (miso ramen) instead. The Soup - was underwhelming. I could taste a slight taste of seafood in the soup but it didn't have the impact of some Japanese style with their strong flavors of sardines or mackerel. The store claims that the soup uses fresh mineral water shipped in from 大雪山 (daisekizan) a mountain in Hokkaido, but to me the special water didn't make it taste special. The Noodles - are thick curly noodles cooked slightly on the soft side. Like the soup, the noodles were uneventful as well. The Toppings - were nothing special. Notice a pattern here? Overall - I can't recommend this place even though I didn't try their most famous dish, I really can't imagine how great their shio ramen could be though. 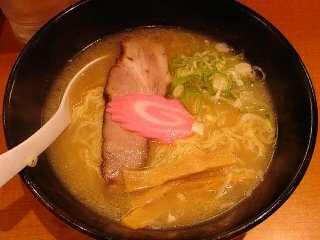 All the flavors of the soup, noodles and toppings were very light, almost insufficient. If you do decide to visit this ramen theme park Shinatatsu, I reccomend you visit Setagaya, Nantsuttei, Higomonzu, or Zouroku, in that order. LOOKS SO TASTY. Good job with the blog, Rod.